(Bloomberg Opinion) -- Bond king Jeffrey Gundlach may not have meant what he said when he tweeted that Societe Generale SA’s Frederic Oudea was running the bank into the ground after making the wrong decisions 10 years ago. But however intemperate his comment was, it will only add to the pressure growing on the French lender’s chief executive officer. It’s not clear which of Oudea’s strategic calls Gundlach has taken issue with. And it’s hard to sustain that Societe Generale’s viability is in question, as it was when Oudea took over as CEO. After another tweet about the tax he pays, the billionaire investor said he will delete his Twitter account, blaming “suspicious activity,” without elaborating. Even so, investors should scrutinize how Societe Generale is responding to last week’s profit warning. Tinkering around the edges won’t be enough to ensure the bank meets its growth targets. Nor will it help to restore the lender to a path of sustainable profitability. When Oudea took over in 2008, the Paris-based bank was working its way through one of the largest rogue trading losses in history. The blunder happened just before the broader financial markets unraveled. Then came the sovereign debt crisis. Oudea, who for years served as chairman as well as CEO, may not have had much choice when trying to put out the various fires during his reign. In one of his more significant moves, he chose to sell most of the firm’s asset management business in a bid to bolster capital. That move has left the bank more exposed to the cut-throat consumer lending market and to the volatile business of securities trading. Societe Generale indicated last week that trading revenue dropped about 10 percent in 2018. It’s a significant setback to the bank’s plan to grow revenue by a compound 3 percent a year through 2020. 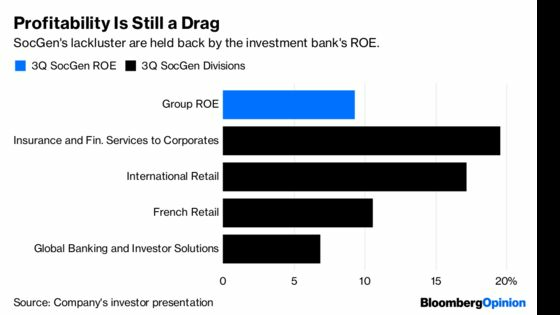 The decline also highlights how the franchise of France’s third-largest bank has deteriorated relative to its Wall Street peer group. Notwithstanding the terrible fourth quarter for fixed-income, the U.S. firms’ equities units held up, while overall trading was flat or up on the year. Societe Generale has yet to give a breakdown of what drove trading revenue 20 percent lower in the quarter. Weakness in equities trading, an area of traditional strength, would be a big concern, as would be a complete meltdown in bond trading. Sources have told Bloomberg News the French lender now plans to cut costs substantially at the investment bank and slash bonuses. It may also close its proprietary arm, Descartes Trading. It’s doubtful the French philosopher and mathematician would want to be associated with the three-year-old venture: it reportedly made less than 1 million euros in accumulated profit between 2015 and 2017, yet it soaks up about 4.5 percent of SocGen’s trading funds. But the firm’s problems run deeper than excessive costs at the investment bank. Its capital buffers continue to remain uncomfortably thin, and will be eroded by a rise in market risk-weighted assets. To try and keep its Common Equity Tier 1 ratio in line with targets, Societe Generale is proposing to pay its dividend in stock rather than cash. Meanwhile, consumer banking is expected to be “solid,” with its French operations in line with guidance. That’s hardly a reason to cheer, given that analysts expect revenue from the business to decrease in 2018 and remain flat this year. Measures of profitability were underwhelming even before the latest slip-up. While the group’s return on equity edged higher to 9.3 percent in the third quarter, it is still below the bank’s modest ambition of at least 10 percent. What’s more, the bank’s most profitable unit – car-leasing and insurance – isn’t even one if its core businesses. The investment bank is still running at a ROE of closer to 7 percent. Gundlach still may not have forgiven Oudea for being fired in 2009 by TCW Group Inc., which at the time was owned by Societe Generale. The parties later settled a lawsuit over the dismissal and allegations that Gundlach had stolen trade secrets. But Oudea is far from running the bank into the ground. His record at delivering growth, though, has been far from memorable. In fact, the bank failed to meet revenue, cost-income and return-on-equity targets in its previous three-year strategic plan. After the latest slip, investors will want a fresh assessment of his current strategy.